Pirates are good, but pirates in space are even better! This one was recommended by several people, including Charlotte at Charlotte’s Library and Stephanie at Views from the Tesseract. Hunt for the Hydra. Jupiter Pirates Book 1. by Jason Fry. Harper Collins Children’s, 2014. The year is 2893. Twelve-year-old twins Tycho and Yana Hashoone are midshipmen aboard their mother’s spaceship, the Shadow Comet. Captain Diocletia runs a family ship, where other crew members and officers include her husband, First Mate Mavry; her father, the extensively cyborg Grandpa huff, and her older teen son Carlo, as well as assorted unrelated crew members whose families have a history of serving aboard the Hashoone’s vessels. They are privateers, with a letter of marque from the Jovian Union that gives them the right to go after enemy ships, which in their case are mostly those from Earth, as relations between Earth and its former colonies on Jupiter’s moons are not entirely peaceful. All three of the kids on board are in training. competing to see which one would make the best captain in time, which is why the story opens with Tycho in charge of a boarding party onto a potential prize ship. As nervous as Tycho is about his first boarding party, the real snag comes when a rough-looking man on board the ship claims to be a diplomat, making the ship immune from being taken. Tycho and Yana just know there’s something wrong, a puzzle for them to put together. At the same time, their family takes a job investigating another unsolved mystery, a bunch of missing spaceships. Could the two puzzles be related? 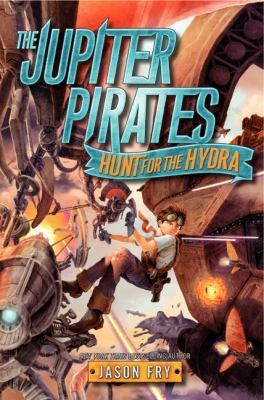 This is a fast-moving and very fun adventure, with strong characters to appeal to both boys and girls, and a setting that’s a nice mix of future space travel and 18th-century piracy. We are so protective of children right now that often in order for children to have any agency in their own stories, the parents have to be done away with somehow, either by dying or being taken captive or some such. While I can’t deny loving a good orphan story, it’s refreshing to have a family where the parents are very much present and competent, but with good reasons for giving their children a lot of independence – even if the two youngest are going even beyond that in their investigations. There’s a lot about the family relationships along with all the outer space and seedy port town adventures, making this appealing for fans of character-driven fiction as well as the more obvious plot-driven fiction fans. At 241 pages, it’s still a little long for my own son to read to himself, though he would love it, but definitely a nice, nonthreatening length for the confident middle grade reader. Book 2, Curse of the Iris is due out in December, and I’m very much looking forward to it. This series would pair very naturally with the steampunky space series Larklight by Phillip Reeve. This entry was posted in Books and tagged pirates, space travel, youth science fiction. Bookmark the permalink.